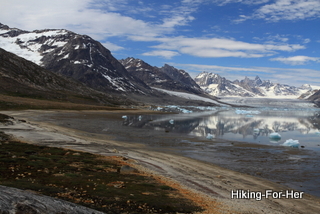 If you think East Greenland hiking involves slogging across glaciers and outrunning polar bears, think again! Add in smoothed rocks covered in lichens and an amazing array of vegetation. Throw in a few arctic foxes, a bird here and there, and whales going about their business in crystal clear water. But where in the world? For a bit of background on this remote region of the planet, take a look at this. 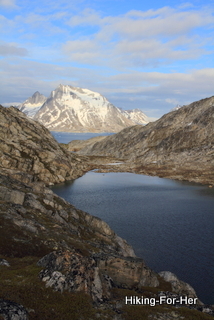 Once you're oriented to how far north you are, come along with me on my hiking trip to East Greenland. Along the way, be sure to appreciate the vast number of water molecules locked up in ice on our planet. And don't overlook those in the icy cold, salty waters. Water, water, everywhere you look along the coast of East Greenland! Arriving in East Greenland from the USA involved a stop over in Iceland for a day. Sure would like to spend some hiking time there! From Reykjavik, a flight to Kulusuk (East Greenland) by plane, then a short helicopter ride over to Tasiilaq on Ammassalik Island (also referred to as Ammasalik) will get you to a jumping off point for your hiking adventure. There are hiking trails right out of Ammasalik, but we opted for a bit more adventure by taking a boat along the rugged coastline. We base camped in two different spots, ending up in the Karale fjord where the Knud Rasmussen glacier was our nearest neighbor. 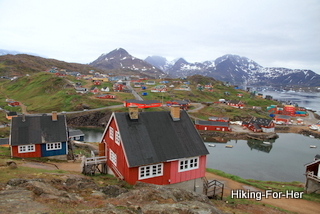 Let's go East Greenland hiking! 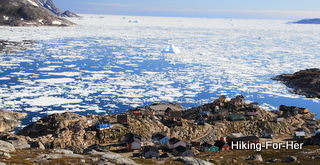 Beach property is scarce along the East Greenland coastline. The mountains plunge into the icy water mile after mile, leaving very few landing spots for boats. Camping just above one of the few beaches in the fjord provided vistas of surrounding mountain ranges, as well as the entertainment of greeting what the tides brought in each day. 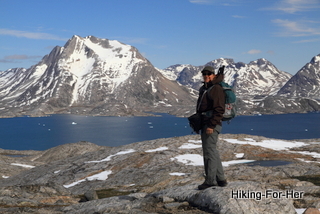 There were plenty of opportunities for exploration during East Greenland hiking. Take the views in these photos, for instance. Below, you can see the view in the opposite direction from the huge glacier. When the sun shines, you can't believe how many mountains you can see! Or how many miles you can log every day in the endless light of the far North summer. If you love dramatic mountain views, cooler weather, and miles of rocky terrain to explore, you'd love East Greenland hiking. But be able to surrender yourself to Mother Nature's whims. Because unfortunately, we were trapped in the Karale fjord by incoming pack ice (a very rare, weird event in July) and had to be heli-evacuated. 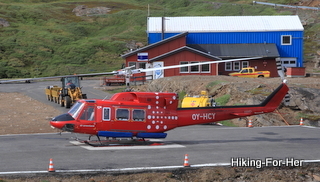 We spent time in Sermilgaq waiting for a helicopter to get us back to Ammasalik. No hiking, just sitting around waiting. Not exactly the trip we had in mind... but Mother Nature rules, as every hiker knows. Here's a photo of what we were up against: ice in every direction, no boats moving anywhere, and a backlog of trapped hikers & kayakers keeping the helicopter pilots very busy. Nothing to do but watch the ice come in from a high vantage point above the village. Or admire how the light changes hour by hour on the surrounding mountains. After several long days of waiting, we made it back to our starting point. It had been a long trip filled with snafus and frustration, but tempered by excellent mountain vistas and exploration. 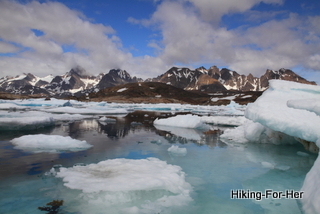 Would I recommend this type of hiking trip to East Greenland? No, to those who need things to run like clockwork, never deviating from an itinerary. 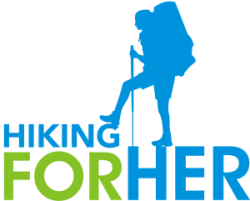 No, to hikers who want established trails and great weather every day. No, to anyone unwilling to yield gracefully to established norms and rules of a different culture. But a big YES, to those who are able to go with the flow (floe), who have no expectations of the weather or the people, and are able to soak in the feeling of being in untamed wildness (once you leave the villages) without much of a safety net. The way I look at it, uncertainty is part of the adventure, isn't it? 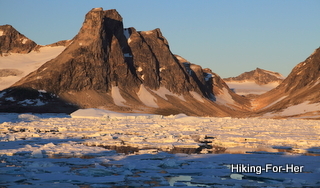 Want to plan your own adventure to East Greenland? You can explore various destinations on Air Greenland's website. If you go to Greenland (or anywhere) as part of a hiking group, be really careful to understand exactly what is covered as part of the trip, and what is not. Email me with questions. 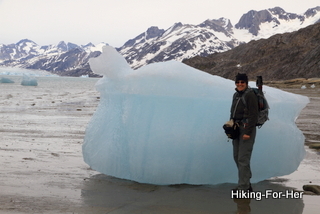 I'd be happy to share my tips for a great hiking trip to Greenland.